Well, who feels like a princess today? Actually, not only do I feel like one, but I am one every day. Just fyi. Just so you know. With Saturday, comes Jen’s Sketch For You To Try and I thought I’d give Dress Up Lily a little princess makeover in pink and yellow. This card is a little hint at something that I’m keeping secret right now until it’s time to share. You can call it a Royal Secret if you want, but I’ll let you know what it is as soon as I get the ok.
Get the Royal Treatment by checking out what the other SFYTT girls came up with this week. Carole has left her castle for the moment, so you can just give her the Royal Flush (just kidding, Carole! Just fashioning a little poetic license) and visit her on Monday when she is back from her enchanted weekend. Also, a new Guest Designer is joining us for the month of May and it's Julie Lacey. WooOHOooOOO! SUSIE Q-TIP: Add a “glow” around an image with Prismacolor Pencils. Blend it with odorless mineral spirits for an awesome faded effect. And yes, it’s ok to use the pencils AND Copic markers on the same image. Just be sure to use a non-smearing ink such as Palette Hybrid from Superior. I get mine from Papertrey. This is soooo cute! I love the color combo and all of the sweet details! Great job! Oh my, how adorable, Susan!! Love the fun colors and your coloring of Lily is superb!! this is just perfectly perfect! How sweet, Susan! 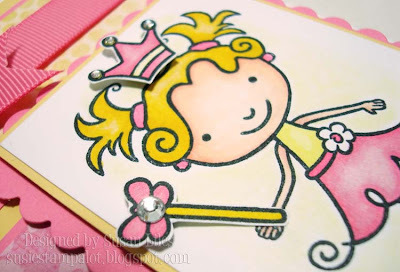 Awesome coloring and embellishments! now how stinkin' cute is this??? Love it!! Very cute Suz! 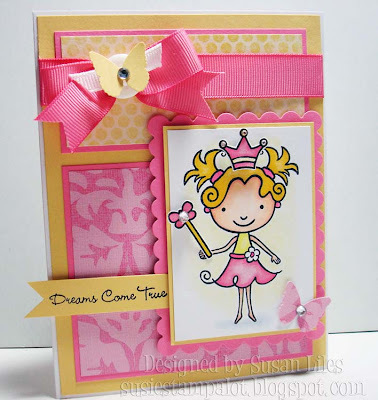 Love those bright cheery colors on that adorable princess! A gorgeous card! Love Lily!